The majority of puzzles on Children's Puzzles are enhanced and made more fun with online player tools. Sometimes though you will want to be able to print off puzzles and play them on a piece of paper, take them on a car journey or on holiday. So these Number Search puzzles are all available in easy printable format as PDFs. 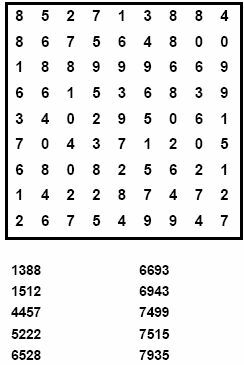 The aim of the Number Search puzzle is simple, but solving the puzzle isn't - we've hidden ten numbers in each grid and you have to find them. They may be hidden going forwards, backwards, up, down or diagonally. Can you find the numbers?